a story the child has dictated, illustrated then acted out with friends at meeting. a copy of each reading word, or sentences made with reading words, in the child’s writing. a written account of a child being helpful to a teacher or another child. a photograph and written description of a block building constructed with a friend after lengthy debate and planning. a written description of elaborate pretend play or progress through a heated conflict. a transcription of a conversation in which a child has participated. small watercolor paintings or oil pastel drawings. photographs of large easel paintings, collages, or wood sculptures. photographs of brio constructions along with the label the child has written or dictated to save his work. a photo essay about a trip to the Eno River, including teacher observations and bits of children’s conversation about the experience. a series of photographs with narrative documenting a child’s progress in learning to draw from life. photographs of a child’s birthday celebration at school. a child’s individual contribution to a class Project or Study. 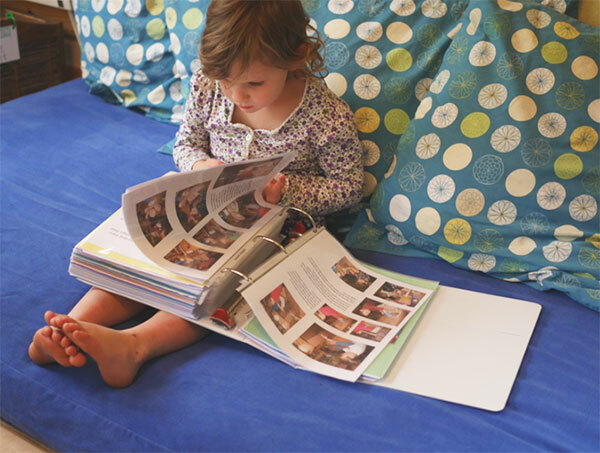 Portfolios have many layers of importance to children, parents and teachers. For us, they are a means for clarifying our thinking, capturing our observations, focusing our reflections and telling stories that are important and moving to us. They are one of the ways we make our respect for the children’s work and our tender feelings about their individuality visible to them and to their families. And they help us remember and reflect when we prepare for conferences. For parents, these books are a window to their children’s lives at school, an explanation of Children First curriculum, and a source of joy and pride. We intend for portfolios to deepen parents’ understanding, appreciation and love for their children. And for children, portfolios say, “You are the protagonist in a compelling story. What you do and what you learn are recognized and appreciated. The grown-ups in your life see you and love you.” And eventually, we imagine the portfolios as a rich archive and inspiration for children as they remember their childhood; reflect on their identity, passions and unique path; and make their choices about who they will be and what they will do in the world. Portfolios can tell you what things happen, like at the Eno and about what you did and it can be a treasure for your whole life and you can keep them and there’s lots of new stuff. It’s so fun to look at them. Your parents or you, when you get older, can read it.